Mary Roberts Rinehart was a prolific writer that is often referred to as the American Agatha Christie. Rinehart's mystery novels are still treasured by millions of readers today and she is the source of the famous phrase "e;The butler did it. 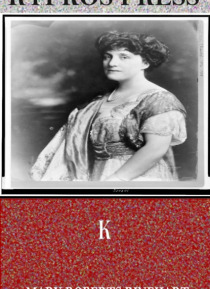 "e; Rinehart's most famous books include The Circular Staircase, The Bat, The Case of Jennie Brice, and The Door.K, published in 1915, is a crime no… vel set in Pittsburgh. The novel centers around a man named Sidney who takes in a mysterious boarder with the initial K.